Europe's billion-euro Herschel Space Telescope is fully operational again after engineers brought its damaged instrument back online. The observatory's HiFi spectrometer was turned off just three months into the mission because of an anomaly that was probably triggered by space radiation. The Dutch-led consortium that operates HiFi has now switched the instrument across to its reserve electronics. It says the failure event has been understood and cannot happen again. "We've had 30 people working on this," said Dr Frank Helmich, the lead scientist on HiFi, from the SRON Netherlands Institute for Space Research. "I don't watch much television but I know Crime Scene Investigation and this was just such an investigation - but in space! We found out what happened and then we designed all the mitigating measures," he told BBC News. The HiFi fault has not affected the performance of Herschel's two other instruments - Pacs and Spire. 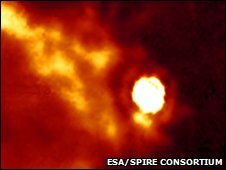 The European Space Agency (Esa) telescope was launched from Earth last May. Its quest is to study how stars and galaxies form, and how they evolve through cosmic time. The Heterodyne Instrument for the Far Infrared (HiFi) is is a high-resolution spectrometer. It is designed to capture and split light into its constituent wavelengths, creating a kind of "fingerprint" that will reveal information on the chemistry of a light source. HiFi is expected to bring remarkable new insights into the composition and behaviour of the clouds of gas and dust that give rise to stars. But the instrument was taken offline in August when it started returning anomalous readings. The detailed inquiry at SRON traced the fault to a failed diode in a Local Oscillator Control Unit (LCU), which is part of the system that helps process the sky signal received by the instrument. Even though the investigators and their "crime scene" were separated by 1.5 million km, the SRON team was able to establish that the most likely cause was a cosmic ray hitting a microprocessor. This upset triggered a sequence of hardware and software actions that ultimately resulted in a powerful voltage being sent through the LCU and killing the diode. HiFi project leader Dr Peter Roelfsema said: "It turned out to be a very complex technological puzzle that we had to solve based on limited information and under a great deal of pressure. "But for all researchers involved, quickly finding an answer to this question was a matter of professional pride. We had to - and would - crack the problem with HiFi as soon as humanly possible, but we also had to take the time to be thorough." Like most space equipment, Hifi has redundant electronics and the instrument is now using its reserve LCU. Measures have also been put in place to ensure another cosmic ray event cannot initiate the same failure sequence. While Hifi was down, its observing time was used by Pacs and Spire to return stunning new images of the far-infrared and sub-millimetre (radio) Universe. They will now reciprocate by giving HiFi 50% of the sky time in the next few months. Fortunately, because of the way the telescope is orientated in space, HiFi's most important targets were not due to come into view until early 2010 anyway. "We will go into a priority science programme," Dr Helmich told BBC News. "We do not fear that the LCU will misbehave again but we have lost redundancy in our electronics and so we want to do the most important science observations first. "One of the first targets will be [star forming regions in] Orion. We expect tens of thousands of [spectral] lines to be seen by HiFi that will all need interpretation." 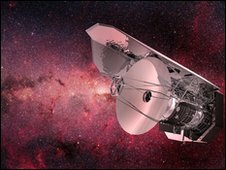 The Herschel mission is expected to last about three years before the superfluid helium that drives its cooling system boils away. 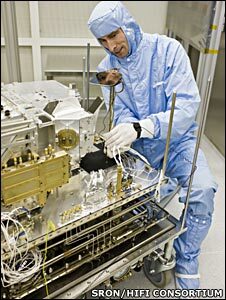 At that point, the instruments' detectors will lose their sensitivity.